It started with one, and then there were two….and now there are many more. Boys, finding something familiar in a place full of unfamiliar voices, food, and customs. Imagine having to leave everything you know after experiencing what has often been violent war, conflict, and oppression; fleeing with little more than the clothes on your back, to a place where almost nothing was the same as from where you came, including needing to quickly learn a language that neither you or any of your family members speak. Just like music, soccer (aka football in the rest of the world), is a game that brings people together, crossing the barriers that so often divide us. When Yves joined our Soccer Club in 2017 he was brought along to fill in at an indoor game by a friend from high school, although shy and quiet at first, his talent became quickly apparent. Within one season he had developed enough to move to an older traveling team. We scrambled to find solutions for his obstacles. He had quickly become like a second son to his first team's manager and her family, who volunteered to drive him to out of town games and tournaments (even though their own son was not on that team). Even after absorbing the administration and coaching costs for many of our players, other expenses like required uniforms, league fees, and travel expenses are a hurdle. With some of our teams having as much as 50% of the team already on financial aid or scholarship, this is a huge challenge and we want to make sure all those willing to put in the work get a chance to play at the right level, however, we have depleted our financial aid funds for this season. Soon after Yves joined us, more of his friends followed, players kept showing up to practices at our training fields at a local park, the coach of our older team welcomed them into his practices, allowing them to practice with his team. At summer tryouts, even more boys showed up, one group sharing a single pair of cleats between four players, just wanting a shot to play on a team. Who had the heart to tell them no? We now have multiple players who want to play on a team; coming from refugee families from as far away as Tanzania, Sudan, Congo, Somalia. Spread across multiple age groups; with their parents focused on learning a new language and working to provide the basic necessities, we are looking to the community to help make their hope of playing on an organized team happen. In the process of forming a new team for many of these players, we need your help in order to make their dreams a reality, they are committed to putting in the work! Coach Kris Gecaj, a former coach in England and current player at Newman University, is excited about the opportunity to coach these boys. If you, your organization or business would like to sponsor one of these players or this team, we welcome your help. Every dime of your donation will go directly towards specific costs (league fees, tournament or uniform) for a player in need. You can sponsor a single player or donate to this specific team, all funds donated through WePay go into a special account. Sponsorship Logo on the team uniforms is also available. A full accounting of all donation appropriation will be available to all donors. Sporting Wichita is donating a signed Sporting KC Player Jersey and ball to be auctioned, if you know of someone interested in these items, 100% of these proceeds will go towards the players in need. Help make a dream come true for these boys, be part of the village!!! 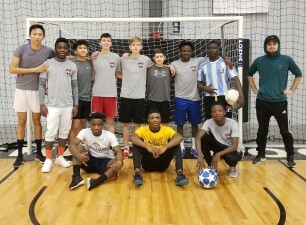 We want to raise the funds so that these boys from struggling refugee families can fulfill their wish to play on an organized league soccer team with a real coach! Administrative Director for Sporting Wichita, Donna has been volunteering and working for the Club for 10 years. Donna believes in the mission and philosophy of Sporting Wichita, the family oriented direction of the organization and the unique diversity of the players and families. "Help Make An American Dream Come True,"